Once the decision has been made to prune or remove the tree, your next decision is whether or not to tackle the job yourself. If you do decide to do it yourself Custom Tree Services offers a wood chipping service, where we come in and chip everything you have pruned leaving you with good quality mulch for your gardens or the woodchip can be taken away. Pruning and felling of trees can be dangerous work. 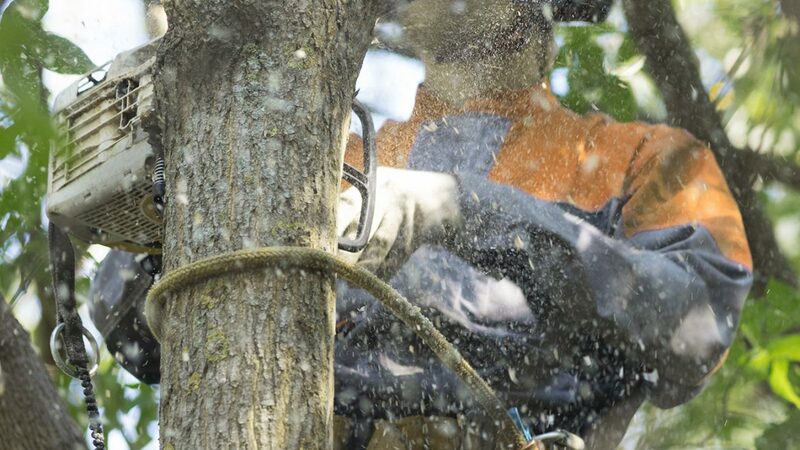 If the job involves working on large trees the knowledge and use of specialized equipment is very important, not only for the safety of the person(s) pruning/removing the tree but also for the surrounding property where the tree stands; homes, businesses, cars, and pedestrians can be put at serious and unnecessary risk. Crown lifting involves removing the lower branches in the crown. This is often done to provide clearance, over paths or roads for example, or sometimes to allow more light to pass beneath the crown. Crown lifting often has limited impact on the amenity of a tree because it does not change the more visible higher parts of the crown. On the other hand, lower branches tend to be bigger so the wounds are larger, which can have an adverse effect on the tree's health. You should avoid leaving a clear stem that is more than one third of the tree's total height. Lower branches have an important role to play in dampening the sway of a tree in high winds. Crown thinning involves the selective removal of branches throughout the crown, such that the overall shape of the crown is not significantly changed. Crown thinning increases light penetration and air circulation throughout the crown. It is important to work throughout the crown, including its outer edges, focusing on removing small diameter branches. Removing too many branches from the centre of the crown can result in a tree with poor structure with few points that can be pruned back to in the future. It can also result in long, thin branches that have little foliage in their lower parts to dampen swaying, putting extra stress on the tree in high winds. Crown reduction is the reduction in overall size of the crown by shortening branches, cutting back to a suitable growth point. Crown reduction is usually used where a tree has outgrown the space it stands in. Crown reduction often results in large wounds at the branch ends, which may start to decay. It should be seen as a last resort. When carrying out a crown reduction branches should be cut back to suitable side branches and a flowing branch line maintained, reflecting the natural shape of the tree. Poorly executed crown reduction is known as topping and is very bad practice - see the 'Useful links' box for more on why. Crown reduction should not be carried out on trees with a pyramidical shape, such as many conifers and birches. Can the top of the tree be removed? Topped refers to the removing of all branches from a mature tree. This is a very poor practice leaving large wounds and a tree with no foliage with which to produce food. It causes considerable stress to the tree, and is not aesthetically pleasing to a property. Does the area around the tree need to be clear? It is preferable that the area around a tree to be pruned is clear to ensure that debris does not endanger property. We will assist with this prior to work commencing.